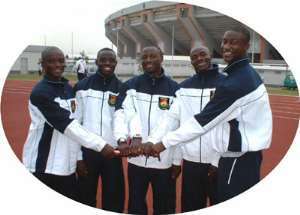 Ghana's athletics team will camp in Germany from July 21 to August 4 ahead of their participation in the Athens Olympics. The training camp in Germany is expected to psyche the team and usher them into competition mood as they bear the flag of the nation into the historic Athens Games. The team will then move straight into Greece in the week preceding the global competition for acclimatisation. The Olympics will run from August 13 to 29.The camp in Germany, according to GAA secretariat, will be a top-up to Ghana's participation in the All African Seniors Championships in Congo Brazzaville. Virtually all of Ghana's top athletics stars in Europe and America have confirmed their participation in the next month's competition in Congo Brazzaville, the secretariat told the Graphic Sports, promising a showcase of the country's expectations at the Olympics. Although over a dozen Ghanaian athletes have qualified for the global event by virtue of records of their performances, the GAA has limited selection for the Olympics to participation and performance at next month's African Championships. At the competition, Ghana is expected to make a larger representation in the jump disciplines and the sprints, while heptathlete Margaret Simpson and 800m runner Akosua Serwah carry hopes in other areas.Sprinters Christian Nsiah, Eric Nkansah, Ernest Osei, Leonard Myles-Mills and Aziz Zakari, African long jump champion, Ignatius Gaisah, and triple jump medal potential, Andrew Owusu, shoulder Ghana's pride into both the African meet and the Olympics. Sprinter Vida Anim will be the sole female ambassador in the short sprints.The fate of United States-based Alexander Tosu will be decided at the national sports festival, which will run between June 13 and 20. The 24-year-old sprinter and long jumper touched down recently from his own sponsorship for a 'justifier' into the Olympic team. His best times of 10.20secs and 20.24secs in the 100m and 200m make him a potential choice for at least the Brazzaville Championships although his best jump of 7.89m in the long jump places him far in the shadows of compatriot Gaisah. Yet, he ranks higher than another fresh star, Seth Amo, who also defends his time of 20.57secs in the 200m at the national festival.